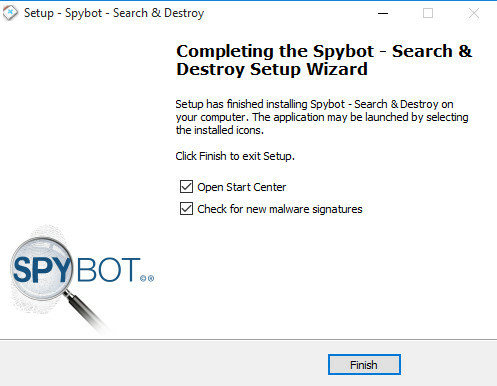 Spybot – Search & Destroy is a free security program that detects and removes adware, spyware and malware of different kinds from your computer. If you see a new toolbar in your browser that you did not install, if your browser display a lot of banner ads, if your browser crashes, if your browser home page or search engine has changed without your knowing, then most probably your computer is infected with adware or spyware. But even if you do not see any signs of infections that have been listed above, it does not mean that your computer is not infected. 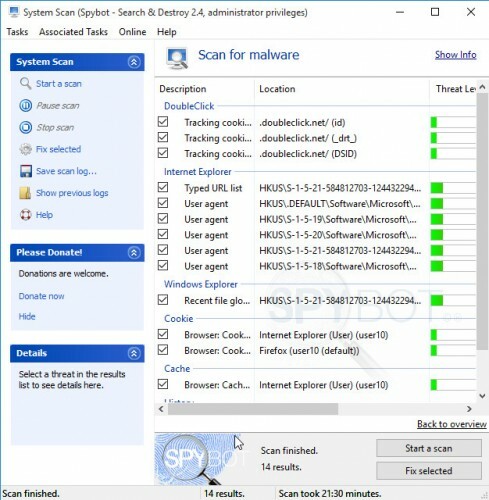 Spybot solves these problems at once, it may clean your computer from infections and protect PC by immunizing your browser and hosts file. 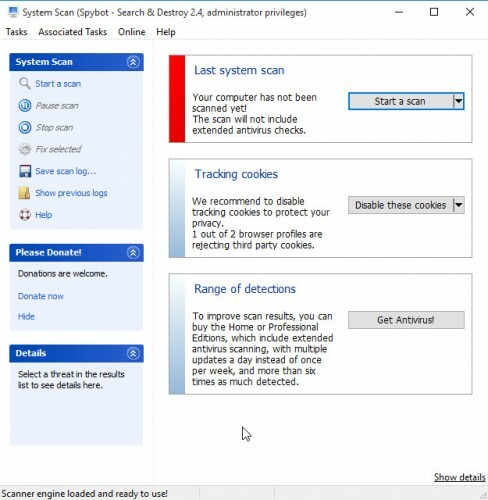 Scan of whole computer to detect and remove adware, spyware, toolbars, PUPs, malware and other infections. Scan single files or specific folders including a network shares. Protect a computer by immunizing Chrome, Firefox, Internet Explorer and hosts file. Whitelist which helps to identify if files are legitimate or not. Free support by emailing Spybot support team. 2. Perform a system scan. 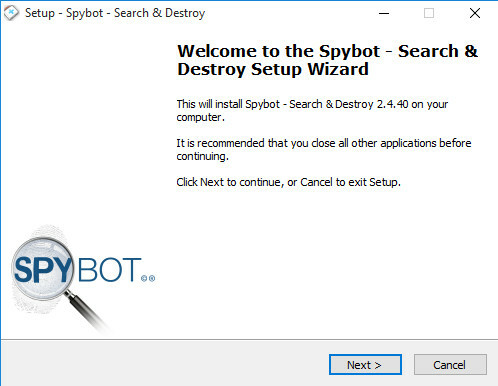 Download SpyBot Free Edition from the following link. Open a catalog where you saved it. By default, all programs are stored in the Downloads, which is in your Documents directory. You will see an icon similar to the one below. Close all programs and windows on your PC. Double-click this icon to start a setup. You will see a prompt similar to the figure below. Click Next to continue with the installation process. Follow the prompts. Do not make any changes to default settings and when the program has finished installing click Finish as shown below. Once the installation is completed, you will see the following window. Click Update button. 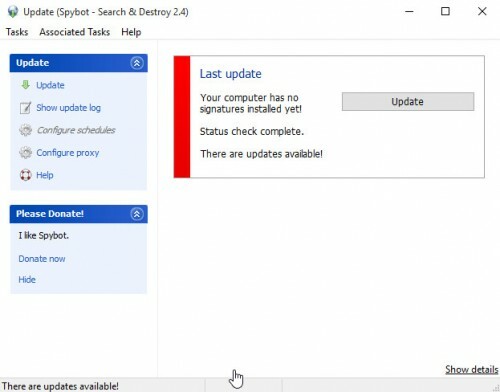 SpyBot will download a latest signature database. Run SpyBot-S&D Start Center. On first run, it will be open automatically. You will see the following prompt. 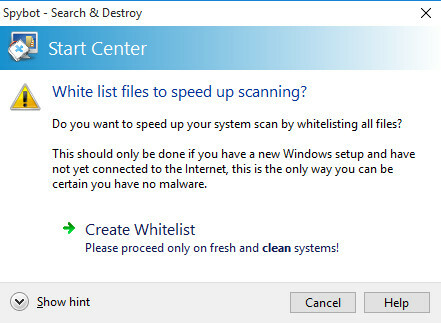 If you installs SpyBot onto a fresh Windows or a new computer, then click Create Whitelist, otherwise click Cancel. It opens a System scan screen. Click to Start a scan button to scan your computer for malware. Full scan may take a lot of time (few tens of minutes). When the scan is completed, you will see a report like below. Make sure all entries have “checkmark” and click Fix Selected button. SpyBot will run a removal process. When disinfection is completed you will a screen as shown below. 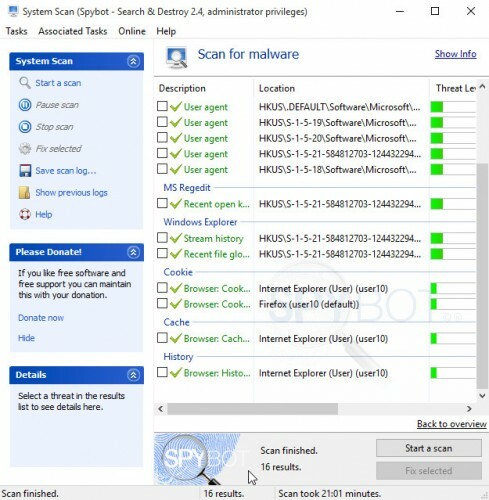 If SpyBot does not help and you are still having a problems, then try to scan your computer with Malwarebytes Anti-malware or ask us for help here. Which free software is the most effective for destroying spyware? 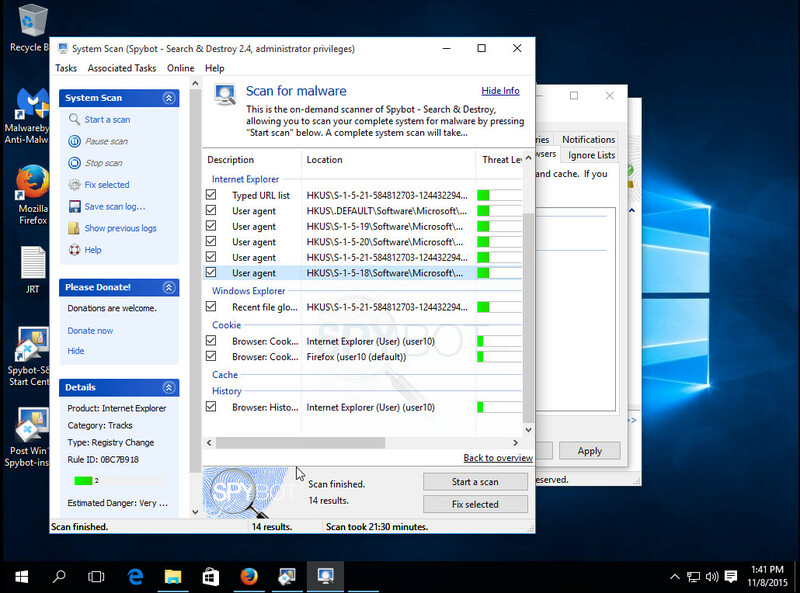 MalwareBytes Anti-malware is Very good and free spyware remover.